The sea temperature was blissful before bacon sandwiches, not seen since last Christmas, were consumed with lashings of tea as the heat of the morning slowly increased. 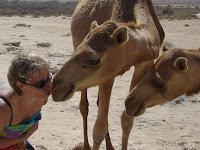 Two baby camels helped pack the car as we took one more dip before departure. 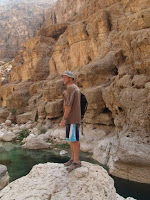 We stopped on the new bridge crossing Wadi Sha b before ambling up the wadi, past the naughty rock and on to the pools. On our return, we noticed several Dutch tourists fussing over one member of their group. 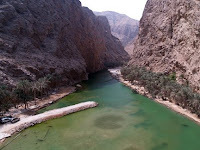 A donkey was then seen heading up the wadi with two boys, which we whimsically referred to as an ‘Omani ambulance’. That is exactly what it wa s – several minutes later while we relaxed in the car, the poor animal appeared carrying a large gentleman to an awaiting ambulance. What great service. I hoped they tipped well. The drive back to the city went quickly with barely a car in sight. We knew we had reached Muscat as the traffic was stationary at Wadi Adai thanks to a now three-quarter length car facing the wrong direction on the roundabout. With everything unpacked, we showered away the grime of the last few days and sat around the table with enormous plates of spaggy bol.